The Fresh Eggs Pillow is a gorgeous burgundy that will add great color to your room! 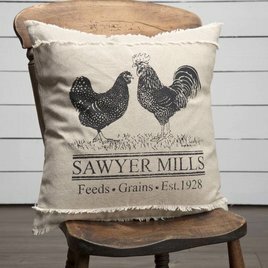 It is made of a burlap fabric and has a sketched rooster design and the words "fresh eggs" in cream colored script. Pillow measures 10" square. Show your Patriotic side with this handmade Flag Pillow. Perfect for a chair, bed or a shelf. Made in the USA by one of our talented Primitive artists! A great touch of Americana for your country home. Show your Patriotic side with this classic, primitive, God Bless American Pillow. This piece of Americana will be a treasured addition to your patriotic home. A perfect accent on your favorite chair or on a bed in your home. 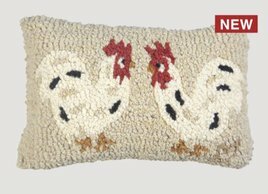 Bring some farmhouse style into your home with this Fancy Poultry Pillow! 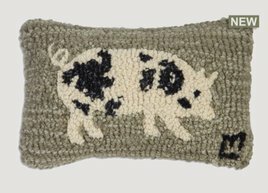 Made of 100% cotton "burlap" fabric this pillow is perfect for a bench or couch in country home. In-stock and ready to ship. Our Grain Sack Stripe Barn Red Pillow is made of Cotton and is 14" x 14" Grain Sack has a timeless design. Bringing a touch of simplicity with a clean statement for any bedroom. 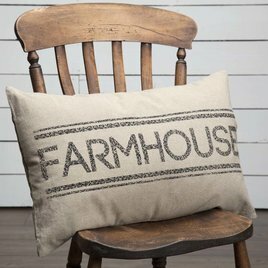 Accent your farmhouse style with the Chester Stripe Pillow. This decorative pillow is so versatile it can be used in different styles of decor! Bold black stripes and an oatmeal colored background make it easy make this a new favorite!